Taken from Whimsical Little Knits - Whimsical Little Knits Book 2: These versatile mittens provide a wonderful flip top to let your fingers out so you can grab your keys really quick. 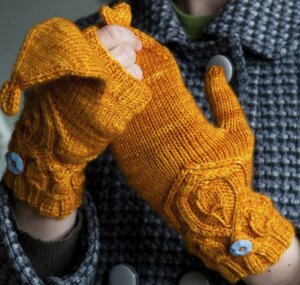 The cable and leaf pattern are simply gorgeous and adorn the back of the hand and shaping for the thumb. This pattern is in Whimsical Little Knits - Whimsical Little Knits Book 2, page 30. Size US 6 DPNs are required but not included. Finished Measurements: Should fit hands measuring 7-8.5" around knuckes.